On 19thAugust 2018, I noticed a late flowering head of hogweed Heracleum sphondylium on the edge of my drive at Nedd (NC1331). 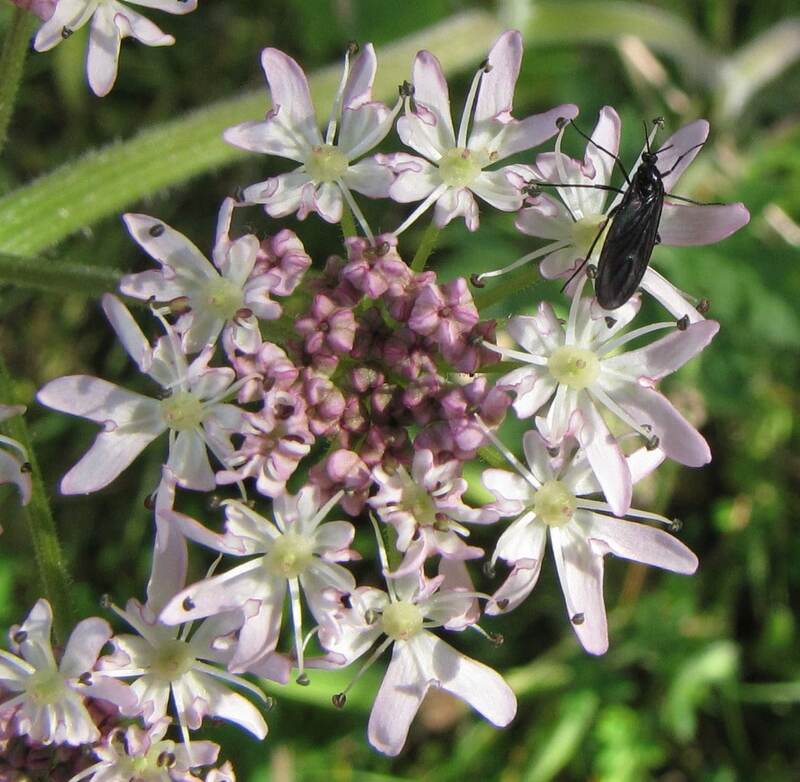 This is one of the larger local representatives of the plant family that used to be called the Umbelliferae (umbel–bearers), with flowers on stalks (or rays) originating at a single point, like the spokes of an umbrella. The slight difference in spelling arises because umbel is derived from umbella, a sunshade, the diminutive of umbra, shade, from which the umbrella gets its name. Political correctness dictates, regrettably, that the family is now called the Apiaceae, i.e. relatives of Apium, or celery. Hogweed flowers are usually white, but these caught my eye because they were several shades of pink, maybe as the result of shading. The flat flowering heads are several inches in diameter (more on well-grown plants) and a marvel of construction. 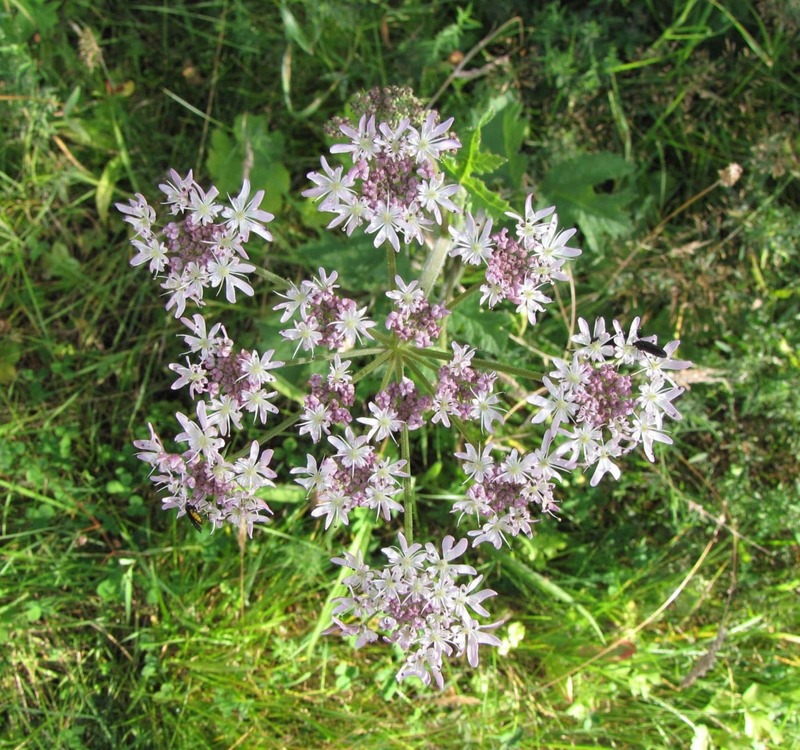 Upwards of 400 individual flowers are arranged in what are known as compound umbels, with 12-15 stout primary rays, each bearing 24-30 finer secondary rays, which carry the actual flowers. Moreover, the rays are in graduated lengths, so bringing all the flowers up to the same level. The subtleties of evolutionary design do not end there, since individual flowers vary greatly in size. The outermost ones are much larger, with deeply-notched outer petals, signalling the attractiveness of the whole structure to any nectar-seeking (and thereby pollinating) insects. The flowering heads of hogweed can be covered with insects in high summer, but this late in the year all I noted were a few small dark flies. These were identified by Stephen Moran as black fungus gnats, members of the family Sciaridae, of which 266 species are listed from Britain and Ireland. Their identification is a matter for the specialist in this and related groups of flies, although a species with a yellow abdomen, which occurs locally, may be confidently named as Sciara hemerobioides. Just to round off this story, the larvae of black fungus gnats live in damp soil and leaf litter, where they feed, as their name suggests, on fungal mycelia. Which neatly links together, in just one tiny corner of the overall food web, the three separate kingdoms (amongst eight or more now recognized) of higher plants, insects and fungi.